Marijuana Business Daily reporter John Schroyer was on the ground in California, posting firsthand accounts detailing the historic, Jan. 1 launch of the state’s recreational marijuana market. Scroll down for an inside account from cannabis business executives pioneering the state’s new adult-use market, which Marijuana Business Daily estimates will generate at least $4 billion in annual retail sales in several years. Click here to read Part I, here for Part II, here for Part III and here for Part IV. Between 1996 and last month, a loose but reliable cannabis supply chain emerged in California from a network of medical marijuana patients, black-market growers and entrepreneurs. Building that supply chain was no easy task. Plenty of business owners endured police raids, court battles were fought with the authorities and countless millions of dollars were made – and lost. But one thread remained fairly consistent: Those who were willing to work in the cannabis business had to be resilient. Back then, he said, all it took was roughly $20,000 to start a medical cannabis business. And, of course, a willingness to possibly go to jail. These days, Ray said, the cost to start a solid marijuana company in California is about $1 million. The millions of dollars that existing operators are putting into large-scale commercial grows and wide-reaching brands. Huge cash influxes from investors and out-of-state companies. The possible entry down the road of industrial agriculture or pharmaceutical companies. Combine all that with how competitive the newly regulated market is going to be for businesses, and it looks just as risky to get into cannabis today as it was a decade ago. It’s just that entrepreneurs aren’t risking jail. They’re risking financial ruin. And, for many, it’s well worth the tradeoff. Yet, a reminiscence of the good old days already is starting to set in. “I’m going to miss it. Those were fun times,” one Humboldt County grower – who did not want to be identified – said as he recalled the days he did business solely in the black market. He’s transitioning to the fully regulated system, which means he now must worry about complying with water rights laws, pesticide testing for cannabis, distribution, advertising and more. The burdens of regulations are driving some longstanding players out of the industry, for various reasons. 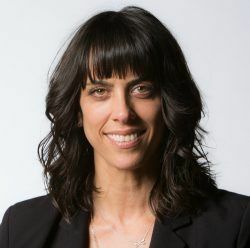 Julianna Carella, who founded the Bay Area edibles brand Auntie Dolores in 2008, quit the infused products business at the end of 2017. For now, she’ll focus solely on her hemp-based CBD products for pets, Treatibles. “The (profit) margins are so slim that there’s no way to make it work with the new regulations, because it looks like they’re going to drastically drive up the cost of production,” Carella told MJBizDaily. But, almost as a revealing side note, Carella offered a thought that seemed to punctuate the uncertainty of the business climate a decade ago – and arguably how unpredictable it remains. “Ten years in the cannabis space was honestly a lot longer than I thought this was going to last,” she said. Others who are trying to navigate the new system face nonregulatory worries – Berkeley Patients Group’s Instagram account was closed Jan. 4 and remained down as of Jan. 22, and the retailer is still trying to get it reactivated even though it’s opened a new account. There are also a mountain of unanswered questions about how state regulations will work. 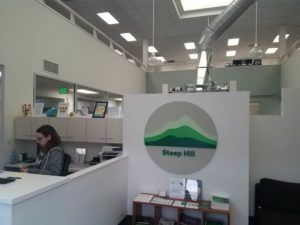 Reggie Gaudino, Steep Hill Labs’ vice president of scientific operations, said California’s emergency industry regulations, released in November, still have a lot of holes. For instance, he said, there’s no specific protocol for how labs will gather samples from growers to perform state-required testing. 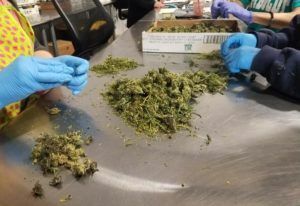 “Now you’re looking at, how does a sampler go out to a cultivator who might have 20 or 30 different strains and go through 50 pounds for each batch to take his 80 grams twice to bring back to the lab?” Gaudino said. Another concern, he said, is what procedure will be used for destroying test samples. “Even if I only go with 2,000 samples per day – that, times 160 grams per sample, do the math on that,” Gaudino said. There also could be upheaval later this year when California’s final regulations are issued and the transition period ends July 1. That’s when retailers will be allowed to sell only product that has passed muster with labs like Steep Hill. And the state currently seems headed toward some type of bottleneck just because California has so few labs. It’s a situation that could prove costly for many companies. Yet, some are banking on a strict testing threshold. 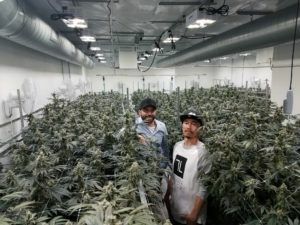 Hendrx Farms, a clone and genetics company in Humboldt County, has focused its core business model on selling clean clones that produce flower designed to pass lab tests with flying colors. “I don’t think people yet realize how important that’s going to be,” Hendrx co-founder Jeff Schirmann said. Tyler Kearns, operator of Sacramento-based SevenLeaves, said his indoor grow operation is in the process of scaling out. The company has spent “hundreds of thousands of dollars” to come into compliance and map out its business future. “We want to be a team in the NBA, playing by NBA rules,” Kearns said. But perhaps the better analogy for cannabis is the sport of boxing. It’s as though the industry has gone from underground, bare-knuckle fighting to pay-per-view heavyweight bouts. “That worry of not being legal is off our shoulders,” said Erez Gudes, the founder of Humboldt County vape cartridge maker Wild Seed Oil. What a great article! As I am in the security and transportation business it greatly affects us as well. This is so overwhelming that the state of California can’t even get a handle on it. It was poorly thought out without the input of the industry they are trying to regulate. Metrc is having issues as well trying to grasp this huge undertaking. May God bless us all in this Wild West we are experiencing!